School Resource Deputy (SRD) Jerome Scott, right, is an employee of the Hillsborough County Sheriff’s Office. 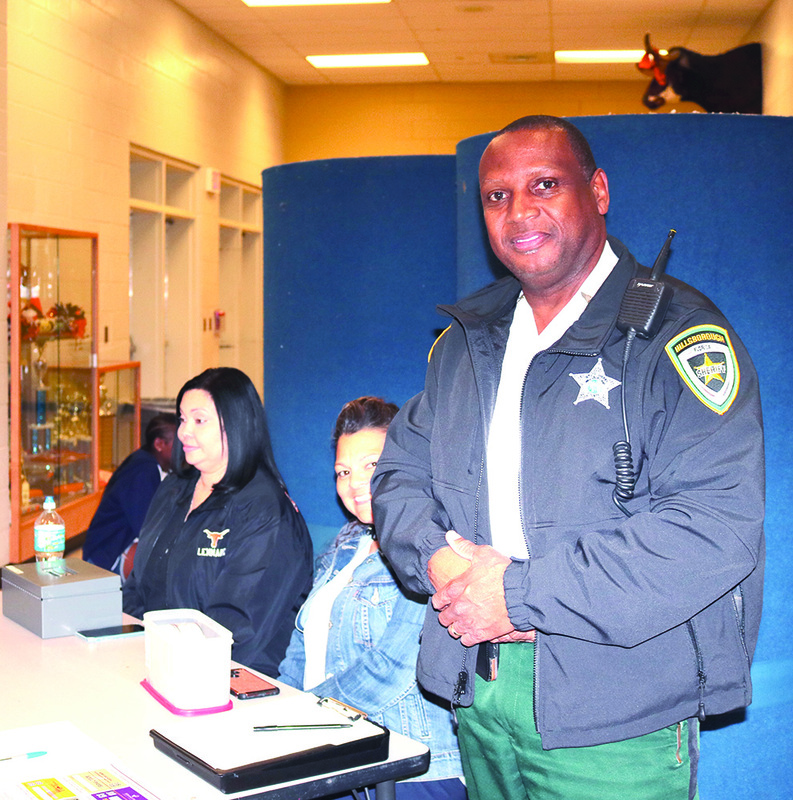 Scott works days at Eisenhower Middle School and nights at athletic events at Lennard High, such as shown above at a basketball game ticket table with Sharlyn Aponte, left, and Martha Lagunas. Whatever the job title and whatever the supervisory agency, public schools in South Shore can rest assured that qualified individuals provide security in each and every school during the school day. 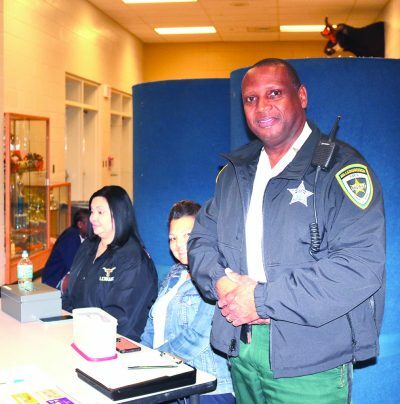 The two vital job categories are School Resource Deputy (SRD) administered by the Hillsborough County Sheriff’s Office (HCSO), and School Security Officer (SSO) administered by the Hillsborough County Public Schools District. Whatever the managing agency, both are armed and both are highly trained first responders. Both are uniformed, in different styles, and sport the shoulder patches of their respective managing agency, and both are just as much concerned with Public Relations (PR), as with law and order, and security and access. Even though no one else in the schools is allowed legally to carry a weapon, concealed or otherwise, both these personnel carry sidearms and handcuffs. The biggest difference is that only the SRD is allowed to make official arrests and transports to jail, either on their own initiative or at the request of an SSO, who is a school district employee. The massacre of 17 students by a lone student-shooter at the Parkland, Fla. high school last year created a heightened atmosphere of concern and anxiety in schools throughout Florida and the nation. One by-product was a new Florida law creating a so-called Guardian Program, a $400 million school-safety law permitting schools to use specially trained, armed “guardians” in schools to respond to active shooters. All school districts in the state must have one armed, trained safety officer in every school. The state legislature allocated one-time funding for the guardian program for the expense of hiring, background checks and training the personnel. School Security Officer (SSO) Andres Reyes, above, visits with some students at Thompson Elementary in Ruskin where he works daily for the school district guarding access and providing security. 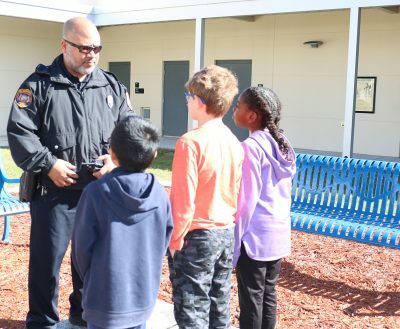 The Hillsborough County Public Schools have had school security officers, termed a School Resource Deputy or SRD, in the schools for 49 years. The SRDs are employees of the Hillsborough County Sheriff’s Office. Under the new law, these deputies continue to staff the middle- and high schools in South Shore and, indeed, throughout Hillsborough County. To meet the state requirement, additional personnel were needed for duty in the elementary schools. Thus, an armed SSO is at every elementary school, on the payroll and under the aegis of the school district. But the recently issued Parkland report recommended that schools should “permit the most expansive use of the Guardian Program under existing law, expanding it beyond just designated guardians, so that regular school staff members and teachers can take part. Arming teachers has been one of the more controversial ideas to spring from the country’s epidemic of school shootings. Though critics say arming teachers could burden them with responsibility beyond their job descriptions and raise a whole new set of safety concerns, its supporters say teachers should have the right to protect themselves and their students. The Florida Education Association, the state’s teacher’s union, has opposed arming teachers and urged lawmakers to “keep additional firearms from our schools unless they are in the hands of trained law enforcement personnel.” School Superintendent Jeff Eakins and Sheriff Chad Chronister do not support arming teachers or other school staff. According to Danny Alvarez, spokesperson for the Hillsborough County Sheriff’s Office, two-thirds of the school district’s current SRDs are current or former law enforcement officers and one-third are current or former military service members. The HCSO provides the school district’s SSO’s hired applicants more than 100 hours of training, which includes active shooter response, defensive tactics, firearms training, CPR/first aid, and legal issues all of which supplement training provided by the school district. Chronister adds that his SRDs work well with the school district SSOs. State law also mandates that each school is required to hold active-shooter training once each semester. A district school safety specialist is required to act as compliance and standards officer for each school to plan and coordinate the active-shooter drills, oversee reporting in the event of a treat or potential threat and assess security features at each school. 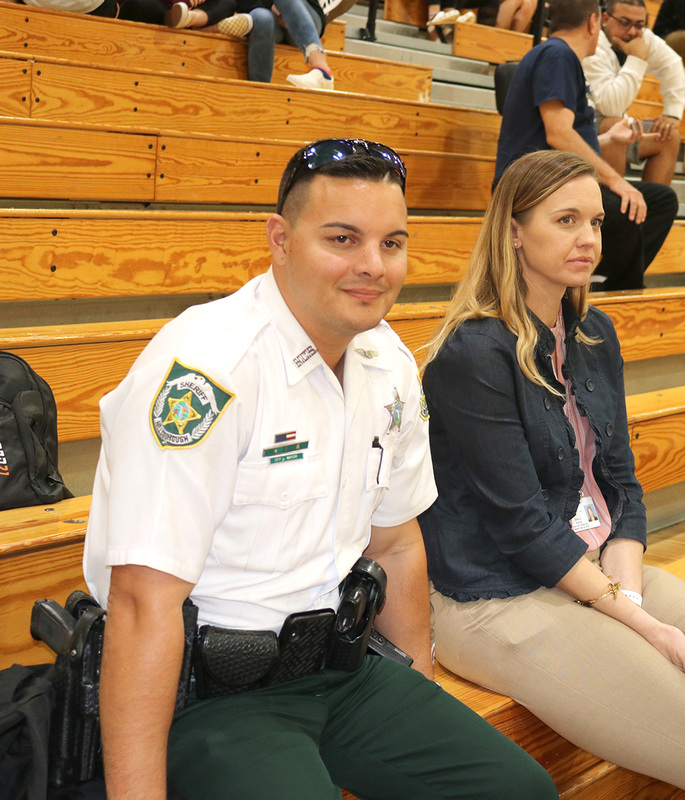 School Resource Deputy (SRD) Larry Mayor, left, with Lennard assistant principal Sara Bogue, works at Lennard High for the Hillsborough County Sheriff’s Office, where he patrols daily and at athletic events. All schools are also required, post-Parkland, to provide to each student access to a mental health professional. Schools are also mandated to establish a threat assessment team with expertise in mental health counseling, academic instruction, law enforcement and school administration. This team is required to meet each month to review any potential threats to students and staff at the school.